Escin helps to promote circulation, and in this helps our Cellumend formula to get rid of cellulite. Escin (Esculin, Aescin, Rosskastanie) is extracted from the Horse chestnut tree and has astringent, vasoconstrictor, anti-inflammatory as well as circulation boosting properties and a sealing affected effect on capillaries and this all helps the formula to get rid of cellulite. The Horse chestnut is a deciduous tree (Aesculus hippocastanum) that grows up to 25 meters and is found throughout the northern hemisphere, but is a native tree to the Balkan peninsula. Escin (Esculin) is extracted from the tree (mostly the seeds) and is becoming very popular in phyto-medicine due to the clinical evidence of its effectiveness in the treatment of chronic venous insufficiency, varicose veins, and related vascular and circulatory disorders and is used in our Cellumend cream. This particular ingredient counters the effects of the shorter wavelengths of sunlight - which gives it the ability to absorb UV radiation but has excellent astringent and toning properties. It is normally only used as a topical application, although European medical practitioners have prescribed it internally - but due to the potential toxicity when taken internally it is not recommended. The action of this ingredient is to prevent vein fragility, which then also stops any leakage from the veins into the surrounding tissue, which would lead to swelling and edema. It is the triterpene glycoside mixture, aescin (escin), which contains the anti-exudative and vascular astringent and toning effect which is indicated to reduce the activity of lysosomal enzymes which is normally found in people with problems with their veins and circulation. This helps to reduce the breakdown of glycoacalyx (mucopolysaccharides) in the capillary walls. Because the veins are healthier and less "leaky", there is less leakage of low-molecular proteins, electrolytes, and water out of the veins into the tissue. The aescin also acts as an antioxidant to help inhibit the enzymes collagenase and elastase which leads to healthier collagen and supportive skin structures and also seems to have some form of anti-inflammatory action. Other constituents found in the seed of the Horse Chestnut tree are 16-Desoxy-Barringtogenol, Acetic-Acid, Alpha-Methyl-Beta-Hydroxybutyric-Acid, Angelic-Acid, Barringtogenol-C , Barringtogenol-D, Cryptoaescigenin, Cryptoaescin, Glucuronic-Acid, Protoaescigenin and Tiglic-Acid. Escin is a venotonic and anti-edematous ingredient and therefore helps to remove excess extra-cellular water. 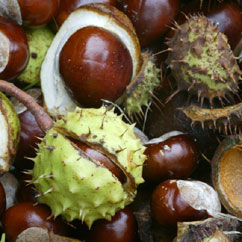 It is an a saponin occurring in the seed of the Horse chestnut tree (Aesculus hippocastanum) and is chemically classed as a biological product.